KENDELL IS PROUD TO ANNOUNCE ITS EXPANSION INTO THE PACIFIC NORTHWEST WITH THE ACQUISITION OF WASHINGTON ARCHITECTURAL HARDWARE (WAH). Located on the outskirts of Seattle, WAH shares KENDELL’s expertise in doors and hardware and maintains a skilled, knowledgeable staff that will support and complement the KENDELL team. This expansion will better equip KENDELL to comprehensively serve customers in our domestic and global communities. 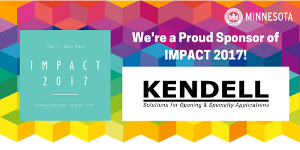 KENDELL is a Session Sponsor for USGBC's IMPACT 2017 Conference. Join us at IMPACT 2017 in St. Paul on May 3rd! The IMPACT 2017 Conference will illustrate through case studies, examples and best practices how green building is growing at the community scale by using innovative technologies and systems, and incorporating health and well being into the built environment. The MN State Capitol is undergoing a major renovation. This is the first time any renovations have been completed on the Capitol since it was constructed in 1905. The MN State Capitol Restoration Project is a $300 million project that has been scheduled to take over three years to complete. The project began in the fall of 2013 and is scheduled to end in 2017.